The Green Man symbolises life, the eternal cycle of death and regeneration. It is said the be a symbol of the union of mankind with nature. The enchanting face of the Green Man with his piercing eyes has been crafted into this brightly colored unique poly-resin bowl. 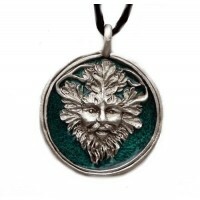 Inside holds 12 double sided, mini pendants of the Green Man. Makes a great offering or wishing bowl. Item Number: KK-33813 | Approximate Size (Inches): 4.00 wide x 4.00 deep x 3.50 high | Approximate Shipping Weight: 1.00 lbs.